The new PANEL21 extends MPL's Panel-PC Family of compact, easy to integrate, and multifunctional All-in-One solutions. The 21" LCD display comes with LED backlight and IP65 front protection, and can be equipped with Intel CPU boards, up to i7 Dual Core. The new 21" LCD with LED backlight can be supplied with 400 nits and a contrast ratio of 1000:1. The resolution is 1920x1080 and the angle of view in all four directions 80°. The Panel-PC can be quipped with different touch-screens technologies and also different LCD solutions (e.g. temperature range). The integrated embedded board computer from the PIP Family is 100% designed and produced by MPL in Switzerland, and can be selected from various low power Intel CPUs, up to i7 Dual Core (PIP30 Family). The PIP boards are equipped with embedded long-term available Intel CPU's, and include features like; up four GbE ports, up to seven USB (3.0 and 2.0), up to four serial ports (RS232/485), PS/2, and an external SATA and PCI-E interface. The units can be expanded with UPS, WLAN, any Fieldbus or can be customized to your needs. A second screen can be added as well on the DVI or DP port. The front of the Panel-PC is IP65 protected and made of stainless steel. On the back are the standard interfaces available for the user. Like all other MPL products, the PANEL 21 does not require a fan, is very flexible, and therefore universal. It can be adjusted to the customer needs and requirements. 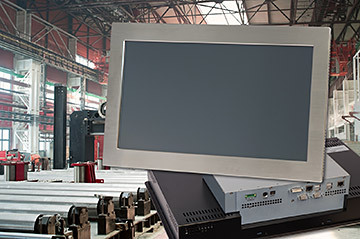 The robust front IP65 protected PANEL 21" is the perfect solution as a man-machine interface in harsh environments. The PANEL21" has been designed and developed in Switzerland based on more then 28 years company tradition and a huge know-how in lowest power consumption and extended temperature operation. According to the company logo "MPL High-Tech • Made in Switzerland" all products are 100% manufactured and assembled in Switzerland by MPL AG.